Vancouver's public spaces – our plazas, squares, streets, laneways, pathways, and waterfront – are where public life happens. These spaces are where we connect with the city and with each other. It's where community is created. Everyone in Vancouver has the right to easily accessible public spaces. As our city grows and transforms, we'll see more people and activity downtown. We need to look at how we can help create and improve public spaces to bring our community together and allow us to grow into a friendly and lively city. This is the first phase of a public space strategy for the broader city core area. What's your big (or little) idea for public space? In the summer of 2017, Places for People Downtown launched a summer engagement campaign and online survey to better understand the public's thoughts and attitudes toward public space in Downtown Vancouver. In February and March 2018, we teamed up with the Society for Children and Youth of BC's "Urban Explorers" program for a series of child-centred engagement events with grade 4 and 5 students at Lord Roberts Elementary School and General Brock Elementary School. Equipped with digital cameras, students led the Places for People Downtown team on a walk through various parts of Downtown Vancouver to demonstrate how children experience the public realm. The students will organize their ideas and share their findings with City staff in May 2018. In February 2018, over 200 volunteers took to the streets of Downtown Vancouver to collect data on how people use and spend time in the public realm during the winter months. Supported by Gehl, the "people data" gathered in the winter edition of the Public Space and Public Life Study will inform the City of Vancouver's upcoming Downtown Public Space Strategy and help bring the strategy from vision to action. As part of the winter Public Space and Public Life Study, Places for People Downtown and Gehl invited close to 200 volunteers to a training session at UBC Robson Square. These volunteers will collect data on how people use and spend time in Downtown Vancouver during the winter months. How do you keep shining in the rain? In January 2018, Hot Tea, Rain City popped up on Granville Street, Jim Deva Plaza, and outside of Vancouver Public Library to hear your thoughts on rain, public space, and green infrastructure. A collaboration between the City of Vancouver's Places for People Downtown and Rain City Strategy teams and Transformation Projects, Hot Tea, Rain City will return. Stay tuned for additional dates! 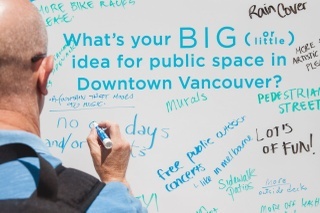 Who are Vancouver’s public space makers? How can we better program and enjoy our public spaces year round? As part of Lumiere Vancouver in December 2017, Places for People Downtown hosted a speaking event on public space in Jim Deva Plaza. Moderated by Jenniffer Sheel, City of Vancouver's Manager of Street Activities, this event brought together some of Vancouver’s top public space activators for a fun and creative discussion on the topic of public life in a rainy city. In September 2017, Places for People Downtown invited architect Bruce Haden to facilitate a discussion with community leaders on the values and principles that should inform public space planning and plaza stewardship in Vancouver. ​Supported by the Vancouver Foundation and the Vancouver Art Gallery, the learning from this event will inform the Downtown Public Space Strategy to be released in 2018. Over 250 volunteers supported Places for People Downtown's Public Space and Public Life Study, the largest study of its kind in North America. A huge thank you to all those that contributed their time! The research collected during the Public Space and Public Life Study was a mix of behavioural mapping, pedestrian counts, and intercept surveys collected over two days in almost 40 locations over Downtown Vancouver. The research gathered in the Public Space and Public Life Study will provide insight into what people like about public space, how they use it and why. Public life surveys will be conducted in September 2017 and again in early 2018 to capture seasonal variations in public life. In September 2017, the City of Vancouver's Places for People Downtown program conducted Vancouver's first Public Space and Public Life Study with the support of Gehl, a global leader in people-centred urban design. John Bela, Partner/Director with Gehl, spoke to over 200 volunteers at the Roundhouse Community Arts and Recreation Centre on the subject of public space and public life. The event was offered as training to volunteers for the Public Space and Public Life Study. In August 2017, the City of Vancouver announced its intention to work with Gehl on Vancouver's first Public Space and Public Life Study. In advance of the study, Gehl's Sofie Kvist joined the Places for People Downtown team for an orientation of Downtown Vancouver. In the summer of 2017, Places for People Downtown offered a series of public space walking tours throughout Downtown Vancouver's neighbourhoods. Hosted by the City of Vancouver's planning staff, the events were designed to familiarize and orient participants on Downtown Vancouver's existing stock of public spaces. On June 29, Places for People Downtown kicked off its summer engagement campaign in Robson Square. Designed to be friendly, colourful and welcoming, the engagement kit was designed with the help of local illustrator Jeff Kulak, with seating provided by FSOARK. In June 2017, Charles Gauthier (left), Executive Director of the Downtown Vancouver Business Improvement Association, joined Gil Kelley, Director of Planning with the City of Vancouver for the official campaign kick-off and media launch in Robson Square.